Our third day in DC was our total overindulgence day. With so many places to try in just four days it was inevitable. 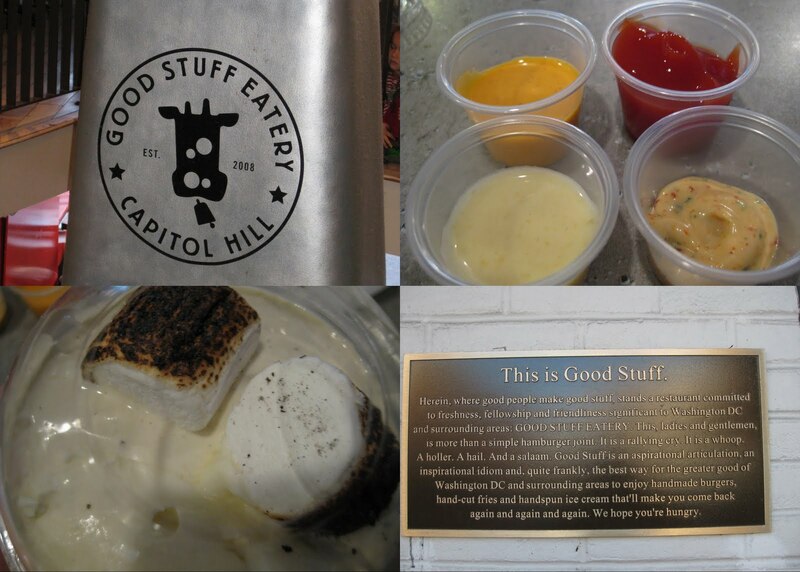 When looking for close breakfast places, we were thrilled to see that Cowgirl Creamery DC was just around the corner. We started our day at the only East Coast location of the famed California creamery. They shop is small, but packed with treats. They brew each cup of coffee individually for a fresh flavor. To start my day, I chose the French roast to accompany a fresh chevre and cranberry sauce sandwich on a ciabatta roll. The combination of tangy, sweet, and creamy was the perfect breakfast. The guys picked caramel sticky buns but they were inhaled so quickly that I didn’t get a photo. When in a cheese shop, you can’t leave without cheese. Mara and I wandered back to the cheese counter to explore the selection. The cheesemonger encouraged us to try as many cheeses as we’d like. I think we would have been sick if we tried to do that! After sampling I picked up a beautiful orange mimolette that looked like a cantaloupe, a soft cheese with sweet and spicy peppers called Devil’s Gulch, and a nutty Californian cheese called Serena. Our morning sightseeing was a tour of Ford’s Theater. The tour guide was “the police chief on duty when Lincoln was shot.” He gave an interesting perspective on the events that transpired in the theater that night. We recently listened to Sarah Vowell’s “Assassination Vacation” on CD and many of the artifacts she mentioned were in the museum. If you haven’t read, or listened, to her books I would highly recommend them. They are entertaining, educating, and full of intricate historical details. After leaving Ford’s Theater and nixing a visit to the Lincoln Waffle House across the street we headed up to the Capitol for the afternoon. Our first stop was Good Stuff Eatery, the burger joint of Spike from Top Chef. This was recommended by a few people. Luckily we were late enough to miss the huge lunch rush and settled in for a greasy burger-fest. There was a fun dipping bar with assorted mayonnaise choices and sauces. Along with ketchup we picked three flavored mayos: sriracha, chipotle, and mango. We all ordered the basic cheeseburger, loaded with special sauce on a misshapen potato bun. The ‘lunch bag’ came with a generous side of Sunny’s hand cut fries with sea salt. To wash it down the hubby ordered a toasted marshmallow milkshake (that’s a frappe to you Bostonians!). Besides the toasty marshmallows on top there were also bits of marshmallows mixed into the vanilla shake. If you are keeping track, this is ice cream #4. We walked off our lunch with a tour of the Capitol. We took the last tour of the day and couldn’t spend too much time exploring the exhibition hall. Once we got outside the sun was starting to set, bathing the Capital in a buttery yellow light. I love the way the building almost glows in the picture we took. Our dinner reservation was still two hours away so we headed up to Dupont Circle to visit Kramer Books. The independent books shop was recommended to Mara and Mark as an interesting place to browse. I picked up a book that I’ve been looking at for a while, Mark Kurlansky’s Food of a Younger Land. When you think about the documenting food bloggers do now about eating, it is interesting to think about what subjects food writers were covering in the 1930’s. To cap off our day of eating we headed to the IMF building in the Foggy Bottom area for dinner at Founding Farmers. 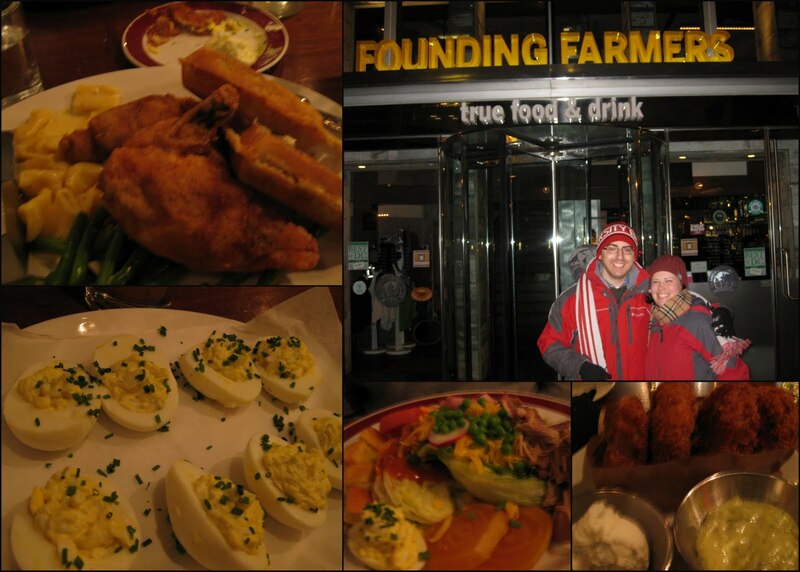 FF had been recommended by both DC locals and visitors. It is owned by the North Dakota Farming Union and they source their food from family farms. FF also has an extensive cocktail menu with something for every taste, including non-alcoholic coolers. We had a great meal, but perhaps one of the strangest service experiences any of us had every experienced! Our server started with an enthusiastic welcome and a very easy to hear & understand rant about his disappointment that Santa had not delivered a Lexus to his living room on Christmas. After he finished that story, he asked us if we’d like to hear about the menu. He launched into his spiel, but he mumbled quietly through it and we had to lean in and ask to repeat every few words. We ordered some creative cocktails and appetizers and spent a few more minutes studying the diverse choices on the menu. When the server came back, we had a few questions about the menu. This is where things got really entertaining. When asking which of two raviolis to order, he answered "neither - go with the short ribs". When we asked about the rotisserie vs. the fried chicken, he said "don't bother with the rotisserie, it’s too salty." And a question about a salad entrée? “It’s good, if you like salad”. He pretty much ruled out 50% of the items on the menu by the time he was done. Regardless of the strange advice, we all really enjoyed our dinners. Mark had a huge salad with roasted beets, fresh turkey, ham, beef, and assorted vegetables. Josh rebelliously ordered a pasta dish. Mara and I ordered the fried chicken and waffles served with rich macaroni and cheese and over-garlicky green beans. The food was fresh, inventive, and flavorful. We would definitely go back when we are in DC again. Next up is another installment of Healthy Snack Wednesdays. On Friday I’ll have Part 3 of the DC dining series. I love reading your recap of DC! So much has changed since I lived there and that cheese shop....oh, my...well, you know.. I'm so glad you had such a great time there and got a chance to check out Good Stuff Eatery! Thanks for posting this. We love to visit DC. I will definitely use your suggestions the next time we go. It sounds touristy (and is!) but we love the cafeteria at the Museum of the American Indian. It's a lot of fun. I'm so glad you mentioned Kramerbooks. I love that place! If I lived in DC it would be one of those places, I would go every morning to read a book and have breakfast. No mention of all the gloves? I adore D.C., and had so much good food while I was in the city. Glad you enjoyed your trip!